“I also give him breakfast, lunch and dinner,” said the teashop owner, as the Anadolu Agency talked to Ko San recently. Ko San earns the equivalent of just ten U.S. dollars a month - a pittance even by the standards of this desperately impoverished country. Child labor is rampant throughout Myanmar, posing a serious problem as the economy opens up following decades of misrule by corrupt generals. 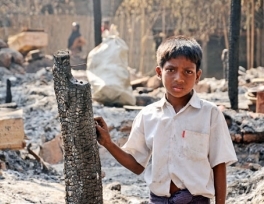 In this corner of violence-hit Rakhine state, though, children from a Muslim minority called the Rohingya have seen their lot worsen considerably since riots struck their communities in June 2012. Ko San is a Rohingya child. He lives on the outskirts of Sittwe, Rakhine’s capital, in a makeshift hut in the Say Ta Ma Gyi camp for internally displaced people (IDPs). He attended school for a year when he was six years old, but since then he has had to work on and off to help support his family. Although he has yet to reach the school leaving age, he has already been a mason’s assistant - helping to shovel cement into bags and worked at a fruit and vegetable stall. And, when Rohingya in Sittwe could mix freely with Buddhists, he was employed by a Rakhine Buddhist at another teashop. That was, before Rohingya were forced out of downtown Sittwe by rampaging Buddhist mobs in 2012. On top of having to sacrifice studies to help feed their families, access to adequate healthcare for young people such as Ko San has become near impossible - a problem that grew worse in March when foreign aid agencies working around Sittwe were forced to evacuate most of their staff for weeks after rioters attacked their homes and offices. To add to the problem, medical charity Medicins Sans Frontieres was expelled from the state in late February, after being accused by the government of being biased towards Rohingya. MSF - which vehemently denies the accusation, saying it has a long history of helping both Muslims and Buddhists in the state - was only recently invited back, but the finer details of a new agreement with the government are unknown. In the months in between, however, the number of preventable deaths has racked up in the absence of much needed humanitarian support. Access to education is no better. Already dire in the days under the military junta, it has become even more difficult for Rohingya since the 2012 riots. The children are no longer able to study at their former schools in downtown Sittwe, and there is now only one government-assigned school that they can attend. Its student numbers have swollen to over 2,000, taught by just 46 underpaid and overworked teachers. The school’s 19 classrooms have fallen into disrepair. In one, a damaged window shutter hung from the one remaining hinge during a recent visit by AA. Advocacy group the Arakan Project says that in the more remote far north area of Rakhine “Rohingya youths and children have little to no access to education” following the 2012 violence. Human rights advocates are hoping Kerry will use the visit to pressure the government on a series of abuses that have taken the shine off the reform process. “Kerry should strongly raise concerns about the persecution of the largely stateless Rohingya,” said Human Rights Watch in a statement released this week. “No one has been held responsible for the 'ethnic cleansing' and crimes against humanity committed against the Rohingya in [the riots of] 2012,” the statement added. In the sprawling fields that stretch between the IDP camps around Sittwe, small children herd cattle as heavy tropical rains leave them drenched. Because of a lack of reliable statistics, it is unclear whether the increasingly desperate conditions that followed the riots have led to an increase in the use of child labor among Rohingya. But with many parents forced out of jobs because they worked in areas that are now off limits to Muslims, and others bedridden as access to healthcare becomes more difficult, young Rohingya face an increasingly bleak future.